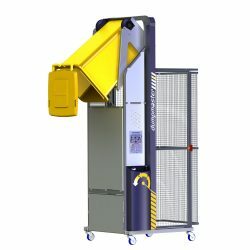 Dumpmaster™ Bin Tippers are the ultimate solution for emptying bins and drums weighing up to 660 pounds (300 kilograms) at virtually any height. The tipping action of a Dumpmaster™ is one of the safest, most efficient, and easiest-to-use systems in the world. The Dumpmaster™ is the workhorse of the Simpro line and has been widely used in Australasia for the past 25 years. The unique, safe tipping action keeps bin weight within footprint. Dumpmaster™ works with popular bin designs, from 32- to 96-gallon (120 to 360 Liter) configurations, without needing adjustments. Custom cradles are available to suit other bin or drum sizes. This state-of-the-art bin tipper is available with a staggering number of optional features including Stainless Steel Construction, Door-End Controls, a Solar Panel, Operator Guard, and much more. Contact the BHS sales team at +1 314 423 2075 to find out more or to locate your nearest dealer. Download a comprehensive PDF above for more information about the Dumpmaster™ Bin Tipper. * Tip Height is approximate as it varies by bin being tipped. Secure the tipper to a bin. On standard Dumpmaster™ models the door is hinged on the right-hand side, but can be hinged on the left if specified at the time of ordering. Battery-powered bin tippers being used outside can be fitted with a solar panel. Depending on the amount of direct sunlight available, up to two tons (1814 kg) can be emptied per day using solar power alone. Instead of the standard side-hinged door, opt for the swing-up door, supported by gas struts and protected by a solenoid operated lock. The door is locked while a bin is lifted or lowered, and the machine cannot run while the door is open. Note: Tip height is approximate as it varies by the bin being tipped.